This was the sixth time Motondi Gerard Orro has visited China. Once a college teacher, the 52-year-old Kenyan sculptor is enthusiastic about his stone carving career and how it relates to China. Motondi first visited China in 2006, when he was invited to the International Stone Carving Symposium in Hui'an, southeast China's Fujian Province, and made his first stone carving work in China named Fish Family. 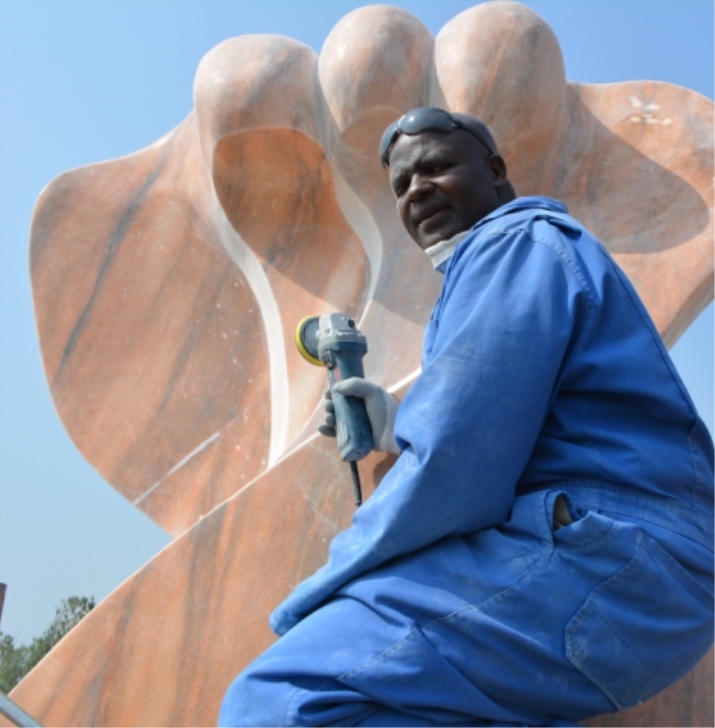 Hui'an is famous in China for stone carving art and often invites domestic and foreign artists to its stone carving activities; but the symposium in 2006 was the first time an African artist was invited. In the following decade, Motondi was invited to art events held in cities like Shenzhen, Shanghai, Beijing, Changsha and Xi'an, visiting different regions of China. But this time, his visit to China was a little different: He was here as an artist of the hosting country. On October 24, 2018, the First Belt and Road Afro-Sino Art Exchange Exhibition and Afro-Sino Cultural Forum was unveiled at the National Library of China in Beijing. The event was hosted by the Ministry of Sports, Culture and the Arts of Kenya, with support from the Kenyan Embassy in China and the Chinese Embassy in Kenya. As part of the event, an art show was held in the library that featured the theme of Go to Kenya and Perceive New Africa. Of some 110 works exhibited at the show, more than half were created by 40 artists from Kenya and other African countries such as Rwanda, Uganda, Zimbabwe and Tanzania. These included paintings and sculptures reflecting the daily life and folk custom of the African people. Exhibited at the show were also over 40 works from around 30 famous Chinese artists. This was the first time Kenya organized artists to show their works in China. Kiprop Lagat, Director of Culture at the Ministry of Sports, Culture and the Arts of Kenya, said that the event was a new form of cultural exchange between China and Africa and Kenya's response to China's Belt and Road Initiative. "We thought the best way of responding to this initiative would be to have mutual exchanges based on mutual respect and mutual trust, because we believe culture is a way in which we can penetrate other sectors," Lagat told ChinAfrica. Among the exhibited 40 plus works of Chinese artists, the most eye-catching ones were those depicting the achievements of the Belt and Road Initiative in Africa. These works were completed after the artists visited Africa on an inspirational tour. Among them was Mombasa-Nairobi Railway on 2017.5.31, the work of a young artist named Ren Deming. Aged 34, Ren is currently teaching at the Academy of Arts and Design of Tsinghua University. When talking about the art exchange exhibition being held, he believed that this was something the artists could do to "bring Chinese culture abroad and foreign culture to China." Ren believes that art should reflect the current reality, and the Belt and Road Initiative and China-Africa cooperation are among the most exciting aspects of reality. His painting Mombasa-Nairobi Railway on 2017.5.31 depicts the scene in a train cab on the railway. The railway was built by China and is one of the most important infrastructure projects in Kenya. 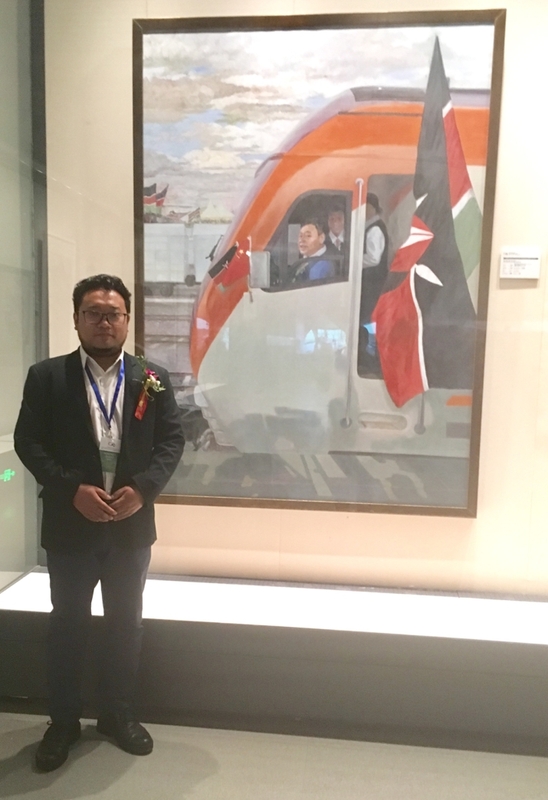 In 2017, Ren joined a delegation of Chinese artists to Kenya and witnessed the launch of the railway on May 31. Impressed by its magnificence, he created the work. "That was my first visit to Africa. When I saw the railway and the stewards dressed in red uniforms, I had a feeling of deja vu. This made me proud because it was the result of China-Africa cooperation," Ren told ChinAfrica. Along with the growth of economic cooperation, people-to-people exchanges between China and Africa are increasingly active. The Belt and Road Initiative lays emphasis on promoting closer people-to-people ties. It is in this context that artists like Motondi and Ren were able to get together and learn from each other. As part of this exchange program, the organizers arranged a visit to the Academy of Arts and Design of Tsinghua University and the Central Academy of Fine Arts. The artists also visited ChinJoo, one of China's largest manufacturers of art materials in Hengshui, north China's Hebei Province, around 270 km from Beijing. To Ren's surprise, the African artists were interested in the tools used by Chinese artists. "They were amazed at very simple tools we use, such as scrapers for sculpting and hammers for wood carving, which they held in their hands and examined carefully." Motondi also recalled that when he first came to China for the Hui'an event in 2006, he was surprised to find that Chinese artists use electric tools to make sculptures. He said that in Kenya, art wares are made for the needs of production and daily life. For example, the traditional craft of pottery is used to make objects for dining and storing; the art of carving is to mark information on rocks, while painting is used to draw the images of animals on walls as a wish for a good hunt. Therefore, artistic creation relies on manual work, and the scale is limited. With the modern tools of his Chinese counterparts, Motondi was more efficient and began to make larger works. He said that he had been given permission to build a hero monument in Kenya's Independence Square in Nairobi. The African artists were not the only ones who benefited from these exchanges. 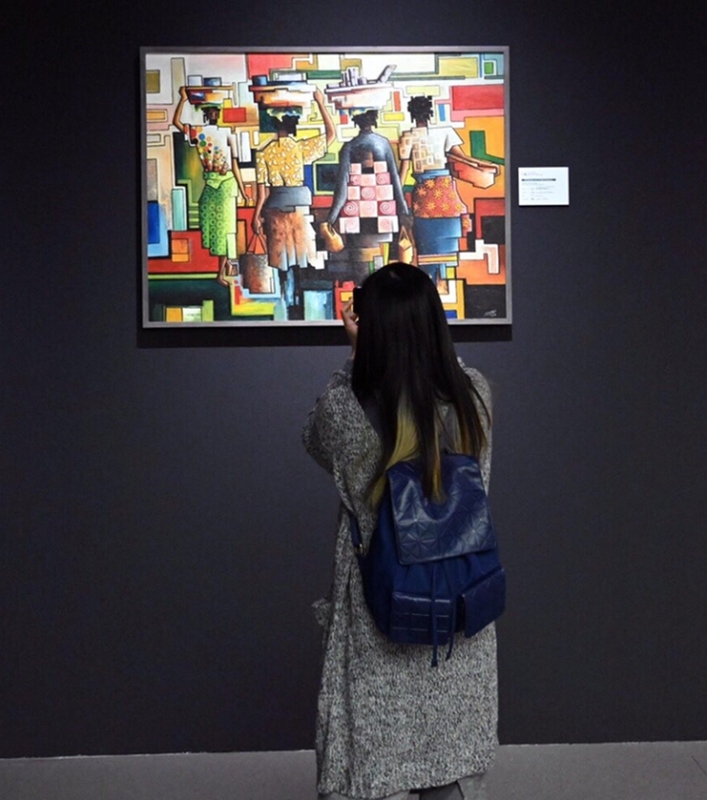 The colorful lifestyle of African artists and the rich natural and cultural exotica of the African continent provide Chinese artists with a great source of inspiration. In his 2017 tour to Kenya, Ren visited the Maasai people to experience the original local life. He also painted with the local artists and exchanged skills with them. The skill levels of African artists deeply impressed him. "They are very good at using materials. They can create with very common materials and come up with inspirational works," Ren said. One consensus that the artists have is that art has an important role to play in China-Africa exchanges. "Art is a universal language," said Motondi. The artist believes that art can cross cultural and language barriers and bring the Chinese and African people closer. Ren said both China and Africa have a long history of art development, but there was not much communication between the two with regards to art. "In history, African arts influenced European countries such as Greece, and the influence of Chinese arts was mainly in East Asia," He said. Motondi believes that Western media reports on China and Africa are distorted and have created obstacles for Chinese and African people to understand each other. "They don't talk about the beautiful sceneries and the animals we have in Kenya, and they don't talk about the coast which is very beautiful, but talk about the diseases of Ebola and malaria, and that our wars are killing people," he said. He hopes that the contributions by artists can change these negative perceptions. "By having our own Kenyan artists narrate the African stories, the Kenyan culture and Kenyan situations, we are able to influence the way by which Chinese people perceive Africa," said Lagat.